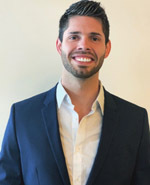 Nathan Gregg grew up in Indiana and moved to Harrisburg, Pennsylvania where he graduated from Harrisburg Area Community College with an Associate of Business Administration in 2015. Following his graduation, he then moved to the Myrtle Beach area to attend Coastal Carolina. After receiving his Bachelor degree in Entrepreneurial Management, Nathan started his own business - Absolute Exterior Cleaning. Nate has a passion for serving others, and with his entrepreneurial mind and driven personality, he wanted to do even more to serve and live a life with purpose. In 2019, he teamed up with Century 21 The Harrelson Group to further serve people of the Grand Strand area. Nathan has learned through his own business, the pride and joy that comes with home ownership and now as a Realtor, his goal is to make the home buying or selling process as easy and effortless as possible for his clients. Having the right real estate agent means getting you one step closer to your dreams. With Nathan’s educational background in business and his professional experience in marketing, sales and customer experience, combined with his passion to lead and serve others, he is committed to guide and support you through your home buying and selling experience. Contact Nate today to get started on your real estate journey. Nate is one of our Top Myrtle Beach Realtors!